in 2017, “anticipated” revenue was €159,576; total expenses were €139,320. Donors include: Rockefeller Brothers Fund, Open Society Foundations, Medico International, and CCFD – Terre Solidaire. In 2015 and 2016, EuMEP received two grants totaling $120,000 from the Rockefeller Brothers Fund (RBF). While the project states that it operates in the “Middle East,” in reality the project’s main focus is Israel, the West Bank, and Gaza. Most of EuMep’s founders have documented histories of anti-Israel activities. In June 2016, Konecny wrote an opinion article for Al-Jazeera calling on FIFA “to exclude settlement clubs from the Israeli Football Association,” as part of a broader campaign against Israel initiated by several pro-BDS groups. In 2012, as part of Crisis Action, Konecny was listed as the contact person for the publication “Trading Away Peace: How Europe Helps Sustain Illegal Israeli Settlements,” a report calling on the EU to impose economic sanctions on Israel as part of a broader anti-Israel BDS campaign. Konecny was also listed as the contact person on the 2009 report “EU’s Position on the Middle East Peace Process: Key Inconsistencies.” The report, written by 15 NGOs, repeats earlier accusations of “collective punishment” and calls for the dismantlement of the Israeli security barrier (the “Wall”) with no regards as to the security it provides. Daniel Levy, co-founder of EuMEP, is also a trustee of the Rockefeller Brothers Fund, co-founder of J street, former member of the board of directors of Molad-The Center for the Renewal of Democracy and the New Israel Fund (NIF), and was the director of the Middle East and North Africa Programme at the European Council on Foreign Relations (ECFR). 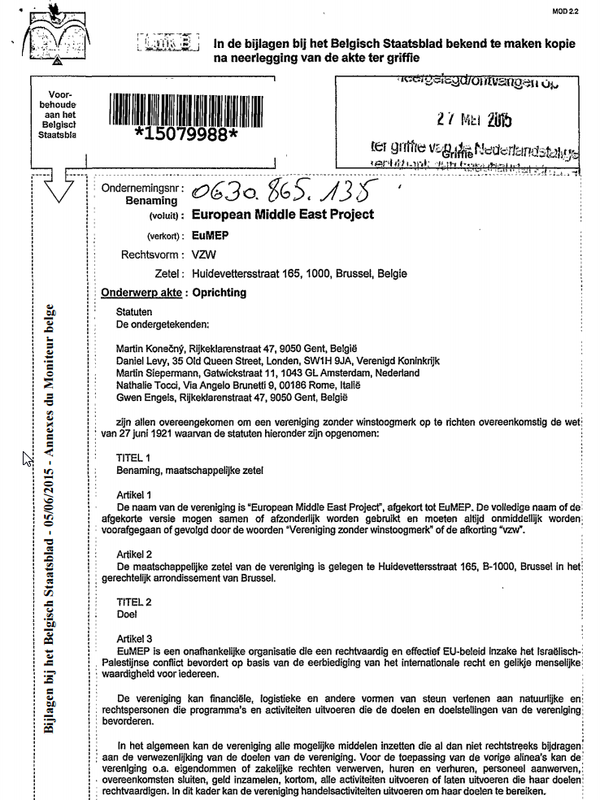 Former director of the Rights Forum, a Dutch NGO that lobbies the Dutch government and the EU to promote BDS and other punitive measures against Israel. Previously worked as Middle East project officer at Interchurch Organization for Development Cooperation (ICCO) and the lobby & campaign coordinator of United Civilians for Peace (UCP). UCP is a platform established by the Dutch NGOs ICCO, Oxfam Novib, Pax Christi, and Cordaid. Tocci is the deputy director of the Rome-based Istituto Affari Internazionali (IAI). Tocci is a member of ECFR’S “Israel-Palestine Two-State Stress Test” expert committee.